Gallup believes that many companies are approaching employee engagement from the wrong angle. Instead of viewing the subject in general terms like creating a positive office atmosphere, it asserts HR personnel should focus on the specific work-related items that the rank and file requires to be productive. The polling giant is backing up the argument with an exhaustive 214-page study that was released earlier this year. 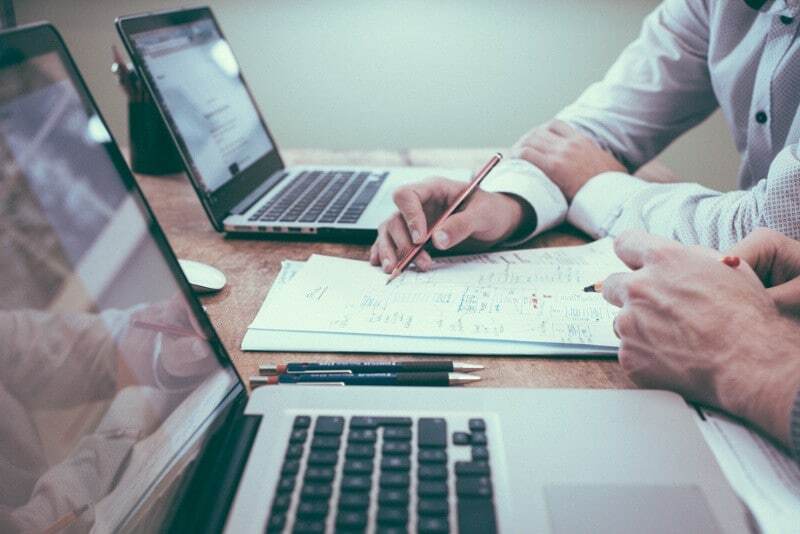 For its survey, Gallup asked a group of U.S.-based professionals about the tools, business processes and other resources that are available to them in the workplace. About a third of the participants ended up meeting the study’s productivity-focused definition of an engaged employee while the rest expressed various degrees of dissatisfaction. From there, the pollster correlated the responses with market data to measure the impact that a business-oriented approach to encouraging productivity can make. The numbers speak for themselves. According to Gallup, teams that rank among the top quarter of their companies in engagement outperform the others across practically all major business criteria. Their lead is especially noticeable when compared to the bottom quarter. Employees at the best-scoring units are on average 17 percent more productive, receive 10 percent higher marks when it comes to customer engagement and generate 20 percent more sales. Added up, Gallup claims that the net result is a 21 percent difference in profitability among the surveyed groups. 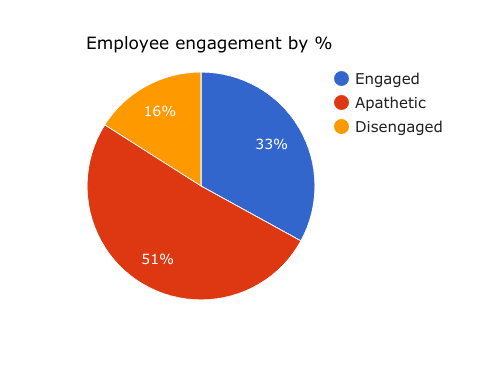 The improved business performance that to-the-point engagement policies seem to produce is mirrored in employees’ attitude towards their work. According to Gallup, the most engaged teams generally see 44 percent fewer unwarranted employee absences than the bottom quarter while also experiencing lower turnover, which is likely another one of the factors behind their increased profitability. The fact that fewer resources have to go towards finding and training replacements is by itself beneficial the bottom line, even when not taking into account the impact on overall output. 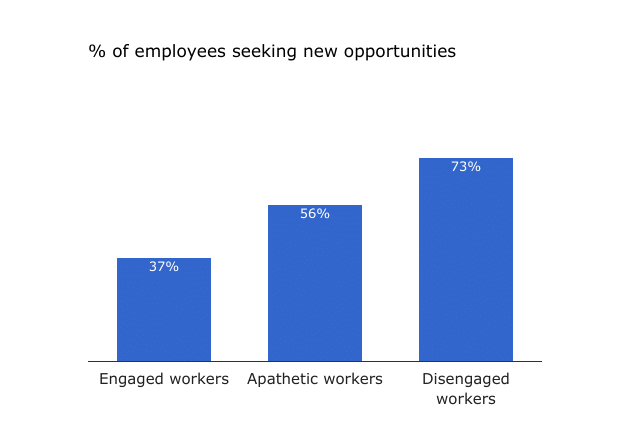 The study found that only 37 percent of the employees considered engaged are actively looking for new jobs, a much smaller proportion than in the broader workforce. The specific turnover rate varies among companies. Organizations with a high annualized burn rate (which Gallup defines as more than 40 percent) on average achieve 24 percent less turnover by following its engagement checklist, while firms with higher retention see a massive 59 percent improvement. The efficiency gains from holding onto employees longer can add up quickly on such a scale. Gallup collected the engagement data at the center of its study using a poll that contained just 12 questions about respondents’ work life. It covered core topics such as whether they have all the equipment they need and how much room there is for advancement in their company. According to the pollster, these questions have changed little in the roughly 20 years that it’s been conducting such studies due to one simple reason: addressing the core work priorities in an office remains the most important part of engaging employees. In other words, many firms would do well to return to the basics before setting up that extra ping-pong table in the recreational area. Next Post →Final Paycheck Calculations, Done For You!